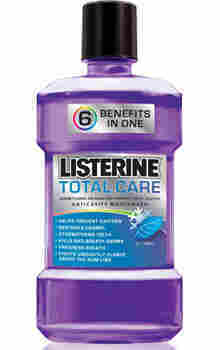 FDA Tells Mouthwash Makers To Spit Out Gum Disease Claims : Shots - Health News Fluoride can help fight cavities. But the Food and Drug Administration told three companies they've gone too far with claims their fluoride mouthwashes can prevent gum disease. If you're in the habit of swirling some brightly colored rinse in your mouth to stave off gum disease, you might want to reconsider. The Food and Drug Administration warned three makers of popular mouthwashes to back off claims the products wash away plaque or promote healthy gums. Sodium fluoride is the active ingredient in the offending products from Johnson & Johnson, Walgreen and CVS. And fluoride is just dandy when it comes to reducing cavities. But as the agency notes, fluoride hasn't been proved "effective in removing plaque or preventing gum disease." The companies said they would respond quickly to the FDA's warning letters, WebMD reported. Under the law, firms that get slapped with FDA warning letters have 15 days to take action to correct the problems. If they don't, the government can seize the products or seek other penalties. If you're interested in the specifics, you can see the J&J letter here, the Walgreen letter here, and the CVS letter here.